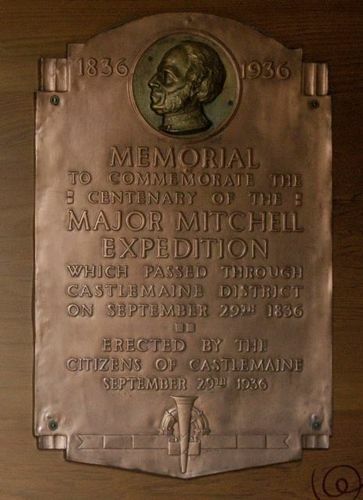 A plaque commemorates the centenary of the passing of the Major Mitchell expedition through the Castlemaine District in September 1836. An adjourned public meeting of a provisional committee representing several sections of the public, has carried a resolution that the town's commemoration of the visit of Major Mitchell in 1836 whilst on his exploration journey, be a suitable mural tablet placed In the Faulder-Watson (old pioneers) hall. This hall is portion of the first post office, and was given to the Old Pioneers' Association by Sir James Patterson nearly 50 years ago. Mr. W. G. Thompson was elected secretary and treasurer of the fund. Age (Melbourne), 17 September 1936.